The Money Quest: What’s Your Effective Tax Rate? What’s Your Effective Tax Rate? What’s your tax bracket? You must have heard this question quite often. But has anyone ever asked you about your effective tax burden? Did you ever thought about your effective rate of tax? Have you ever tried to calculate it? We keep on carping about the high taxes by keeping in view only maximum marginal tax rates, without ever giving a thought to the exemptions and deductions we avail. Taxes are determined based on your taxable income. Taxable income is broken down into different brackets or slabs, each to which a different tax rate applies. The highest tax slab rate relative to a taxable income is called marginal tax rate. Put simply, the highest rate of tax applicable on your marginal or additional income is called marginal rate of tax and is the rate you pay on your last rupee of income. Marginal tax rate is important because while making investment decisions, you need to consider your marginal tax rate. However, marginal tax rates do not fully describe the impact of taxation. 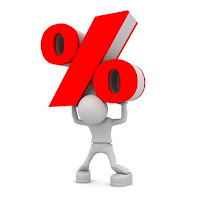 The effective tax rate refers to the actual rate of tax borne by you. It is the average rate of tax which you actually pay on your total earnings / income (i.e., both taxable plus non-taxable income). It is obtained by dividing the total amount of tax paid by you by your total earnings expressed as a percentage and indicates your effective tax burden which is always lower than your maximum marginal rate. 1.Your entire income doesn’t get taxed. For example, you are entitled for various exemptions (e.g. HRA, long term capital gains on sale of equity shares, dividends etc) and deductions (such as section 80C and 80d) due to which your taxable income is much lower than your actual total earnings during a particular year. 2. Further, unlike corporate tax rates, your total taxable income doesn’t get taxed at a flat rate. There are different slab rates of tax applicable to individuals. Right now, the lowest tax slab rate is 10% and the highest is 30% (plus surcharge and education cess). Besides, there are certain other incomes which are taxed at concessional rate of tax. For example, short term capital gains under section 111A are taxed at a flat rate of 15% (plus surcharge, if applicable and education cess). Furthermore, ‘Effective rate of tax’ is also different from ‘Average rate of tax’ which is average rate levied on your ‘Taxable Income’ and is calculated by dividing ‘total tax obligation’ with ‘Taxable income’. Your ‘effective rate of tax’, on the other hand, reveals the average rate of tax for all your income (taxable as well as non-taxable). Let’s clarify the difference with the help of an example. Suppose that you’re having a total annual income of Rs 17 lakh out of which Rs 4 lakh is exempt (i.e., not taxable) from income tax. Further, let’s say that you are entitled to deductions amounting to Rs 1.6 lakh under various sections of income tax such as section 24(b) and section 80. Thus, your taxable income comes to Rs. 11.4 lakh (which includes short term capital gains of Rs 2,30,000 taxable u/s 111A @ 15%). Based on the tax rates applicable to ‘other individual’ (i.e., neither women nor senior-citizen) for the assessment year 2009-10 (PY 2008-09), the total tax liability works out to be Rs 2,40,760. So, we arrive at an effective tax rate of 14.16 per cent, which is less than half of marginal tax rate and almost two-third of average tax rate (marginal tax rate of 33.99% and average rate of tax of 21.12% ). Now, finally calculate your effective tax rate. Isn’t it revealing? Feel free to share it with others by writing in the comment box.